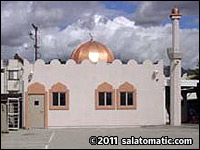 Established in 1987,Masjid Gibrael to serve the needs of Muslims in San Gabriel, Alhambra and surrounding communities. The Masjid provides a religious and educational environment that meets the growing needs of our diverse and ever-expanding Muslim community. Masjid currently provides an open facility that hosts the five obligated prayers on a daily basis, Friday congregational/Juma’a prayers, weekly lectures, family events, youth programs, Ramadan iftars and Qiyam prayers. Facilities include a Mens’ and Womens’ prayer hall, multipurpose rooms, playground, and a Sunday school.